The Coral Red Pencilfish (Nannostomus mortenthaleri) is endemic to the Nanay Basin in Loreto Department, Peru (specifically in a small tributary of the Rio Nanay, at the village of Alvarenga, Loreto, Province of Maynas) and a little west in the Río Tigre system. Tropical fish keeping enthusiasts also know Nannostomus mortenthaleri as the Red Arc Pencilfish, Peruvian Red Pencilfish, Ruby Red Pencilfish, Red Pencilfish, and Nannostomus cf. marginatus red. 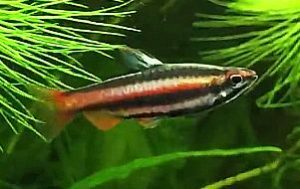 The Coral Red Pencilfish is predominately found in the densely vegetated areas of flooded forests, flooded backwater lakes, slow moving tributaries, small rivers, and swampy areas around submerged bogwood and leaf littered bottoms. They like shallow, almost stagnant areas with negligibly detectable water hardness and a low pH of around 4.0 to 6.0 where other lebiasinids, characids, and other dwarf cichlids reside. They are usually collected in thickly vegetated areas where fallen branches and lots of leaf litter cover the bottom. Originally described as Nannostomus marginatus, Coral Red Pencilfish are distinguished by the following combination of characteristics. Adult males have vivid bright red pigmentation between the central and upper dark lateral stripes. The red extends from the tip of the snout, above the iris, through to the caudal fin base. They have three distinctive dark lateral stripes. ose fin. Adult males develop a white marking at the anterior dorsal fin base at quite a young age, are noticeably less stocky than their female counterparts, and are much more colorful. Male Nannostomus marginatus can be immediately identified from Nannostomus mortenthaleri by the lack of red pigmentation on the body. Coral Red Pencilfish are a gregarious, mildly aggressive shoaling species, that due to their small size and relatively timid nature are not ideal candidates for a community tank setting. At least a dozen or more specimens should be kept together to minimize aggression between males and to bring out the best coloration. They require a moderate amount of swimming space and when crowded or placed alone into a community tank environment, they become more timid and their colors less vivid. Coral Red Pencilfish are ideally kept in a densely planted single species tank of at least 15 gallon capacity with a dark medium to fine dark gravel substrate, some driftwood branches, some floating plants to diffuse overhead lighting, and some dried Indian Almond Leaves to promote the establishment of microbe colonies. As the dried Almond leaves decompose, tannins and other beneficial chemicals are released into the water as well as microorganisms that provide a valuable secondary food source for the fry. Because Coral Red Pencilfish prefer still to very slow moving water conditions, an air powered corner sponge filter is recommended for filtration. These fish need “aged” stable water to thrive and should never be introduced into an immature aquarium environment. Although Nannostomus mortenthaleri have been bred in an aquarium environment, it has usually been an unintended accomplishment. In a mature, densely planted, single species aquarium environment, you may suddenly see small numbers of fry swimming among the vegetation and the leaf litter however, if you want to increase the amount of surviving fry, you might want to try a more controlled approach. Condition an adult group of Coral Red Pencilfish and place a pair or a small group into an aged aquarium planted with Taxiphyllum or some other fine leaved plant, or just place several fine wool breeding mops in a bare tank with aged water and a small, “aged” air powered sponge filter. When more than one pair is placed in the breeding tank, separate the plants or wool breeding mops into territories to prevent aggressiveness. After two or three days eggs the adults should be removed from the breeding tank and fry should become visible within a couple of days. An alternate method that is often used with wool breeding mops is to check the mops on a daily basis and when the eggs are visible, remove them to a rearing tank to hatch out the fry. If the fry are in a tank with an aged leaf litter bottom, they will do fine on their own until they are able to ingest microworms, newly hatched brine shrimp, etc. Otherwise, the fry should initially be fed Paramecium or an extremely fine (5 to 50 micron size) powdered dry food. After 8 to 9 weeks the fry will begin to develop adult patterning. In their natural habitat, the Coral Red Pencilfish is a micropredator that feeds primarily on tiny invertebrates and other zooplankton. In an aquarium environment, they will usually accept small or crushed dried foods along with daily offerings of live, frozen or freeze dried Artemia nauplii, grindal worms , Moina , etc. Although uncommon, the Coral Red Pencilfish is usually available to tropical fish keeping enthusiasts through specialty fish keeping shops or online at reasonable prices when they are approximately 3/4″ to 1″ in length.